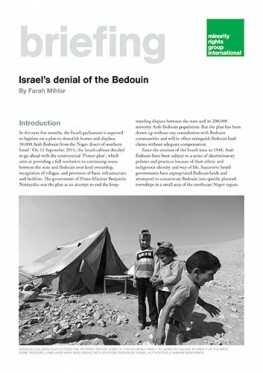 Based on a Minority Rights Group International (MRG) field visit to the region in September 2011, this briefing describes the ongoing human rights violations against Bedouin communities in the West Bank and the Negev. It discusses the implications of the government plans. Finally, it calls on Israel to comply with relevant international human rights standards and immediately halt proposed legislation and plans to displace Bedouin, and instead develop a plan based on meaningful participation of Bedouin communities.